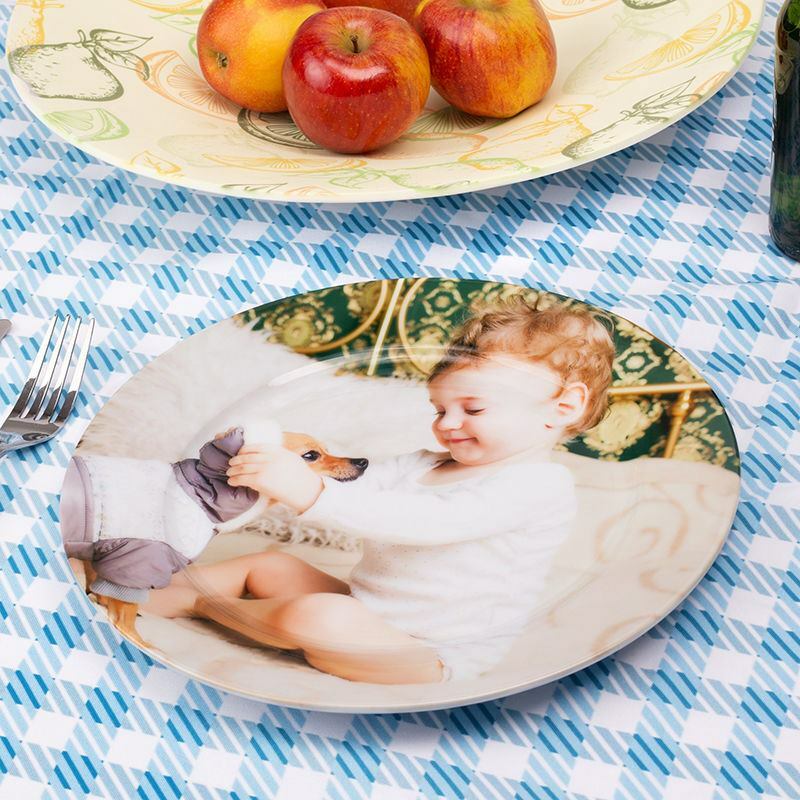 Add an extra special touch to your dining table with your own custom printed plates. Made from ceramic in 20 centimetres diameter (eight inches), they’re a wonderful addition to your dinner party service to serve bread and nibbles. Photo plates look stunning with a beautiful design or printed with family pictures. Food is fun so our plates should be too! Design your own photo plates for your dining table or as a beautiful keepsake gift to a loved one. These china plates customised with your photos are an ideal way to serve side dishes such as bread rolls. Use them at a dinner party or afternoon tea, and your guests will be super impressed. The print is bright, clear and sharp, so these will really stand up against even the glitziest of tableware. Colours are now even brighter than before and more accurate to your design. Your image is printed onto the top of the plate and the underneath is left white for a nice contrast. If you wish, your photo can be printed edge-to-edge for a dynamic colour explosion. Your unique photo plate comes with a black stand, which you can use to securely prop your plate off to display it to its fullest. This is ideal to use if you want to use your plates for ornamental purposes. Like many of our products, the photo plate comes with a quantity discount, so buy a set today and save money. Your personalised photo plate is custom made to order by our printing professionals. We digitally print on plates using a process which gives the image a long life – if care instructions are followed. Everything is finished by hand and carefully quality checked to ensure your custom dinner plate is of an excellent standard. Care: wash by hand to preserve the print. Not dishwasher safe; do not put in the dishwasher. Important: Your unique photo plate is suitable for serving nibbles and sides such as bread rolls, cupcakes, biscuits, sandwiches. Do not use cutlery with your custom plate as this will damage the print. Not suitable for eating main dinners off. Take advantage of full colour plate printing and choose a single image to fill the surface of the plate, or create a beautiful photo collage featuring all your much-loved snaps. These china plates are perfect for all over printing, and this style of printing works best rather than an image placed in the middle. Printed in full colour, edge-to-edge, you can really make a statement on your dining table. Because our plate printing technique is designed to fill the surface area, if you've tried to place your image in the centre, we cannot always guarantee it will be perfectly in the middle. So have fun designing a collage or bold graphic plate that's full of colour and personality. Handy Tip: Select pictures or create repeat pattern and avoid trying to centre a design or add text close to or all around the edges. Due to our printing method there will be on average +/- 10% difference in positioning of your design. When you are creating your personalised small plate, please take note of the bleed area within the design interface. You need to ensure that your image fills the whole area, otherwise, you will end up with uneven white edges and you will find that your final print is likely to be off-centre. To make your dining table fun for everyone, design custom plates for all the family featuring their name and photo. This way, you’re all sharing a fun experience as well as dining together. For might also encourage the little ones to help serve dinner - they can bring out the bread rolls on their very own photo plate. Sometimes finding the right ceramic plates to match your home décor can be tough, so why not design your own? Choose a shabby chic design to match your bohemian style, or print a loud pattern to complement your kitsch dining room. Whatever your style, custom print your own photo plates and express your personality! They’re not just great for the table though. As a decorative plate, or photo gift, why not print an important question you want to ask a friend or loved one. I.e. ‘Will You Be Our Baby’s Godmother?’ or ‘Will You Be My Maid of Honour?’. Not only will they be thrilled at the idea but they also have a special photo plate to remember the moment. Design your own party plates online. Picnics set, tableware, melamine dinnerware, plastic plates to be designed right here.